The Detroit Pistons played with lackluster effort for a half against the Philadelphia 76ers, leading their first-year coach to criticize their intensity and at least one player to agree with him. 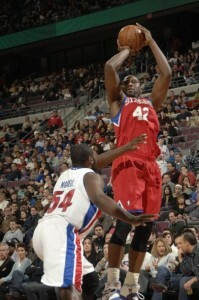 Elton Brand matched a season high with 25 points and was one of six double-digit scorers for Philadelphia in a 104-94 victory over the Pistons on Saturday night. “I thought we were passive at times,” Detroit coach John Kuester said. That seemed surprising because Detroit has lost 12 straight in its worst slump since April 1994. It was only two years ago that Pistons last made it to the Eastern Conference finals. Injuries and poor personnel decisions have turned back the clock for the franchise since then. After 12 straight losses they stand at 11-24 for the season. Still a hell of a lot better than New Jersey’s 3-33.